Three of the companies targeted in the 2017 proxy season – Morguard Corp., Canfor Corp. and Constellation Software Inc. – currently have no women on their boards. The fourth company, Restaurant Brands International Inc., which owns the Tim Hortons and Burger King chains, added one woman to its board last year after a proxy campaign by mutual-fund manager OceanRock Investments Inc.
OceanRock chief executive officer Fred Pinto said the appointment of Cecilia Sicupira to the Restaurant Brands board last year did not satisfy his firm’s concerns because she is the daughter of Carlos Sicupira, a Restaurant Brands director who co-owns 3G Capital, the largest shareholder of Restaurant Brands. Mr. Pinto said Ms. Sicupira is not an independent director who brings diverse views to the table. He said OceanRock’s proxy resolution this year asks Restaurant Brands to adopt a “more formal and transparent” genderdiversity policy, laying out the steps it will take toward adding several women to its board. “We acknowledge companies can’t move overnight on fairly substantial and material issues, but we want to see what your plan is to get there,” he said. Restaurant Brands said in an e-mailed statement on Tuesday it has a policy of considering an array of diversity factors when selecting director candidates. The company said it believes a diverse work force promotes “a culture of equality and inclusion,” noting it has two female executive officers. The proxy proposal campaign was organized by Vancouver-based Shareholder Association for Research and Education (SHARE), which works on behalf of investors seeking governance improvements at companies. SHARE engagement analyst Delaney Greig said the four companies targeted in 2017 were chosen because SHARE’s investor clients had significant holdings of their stock. They are also companies that SHARE has previously asked to change their diversity policies without sufficient response, she said. Ms. Greig said SHARE, which votes shares for some of its clients, will withhold votes for directors who sit on nominating committees if a board has no women and no clear policy to improve diversity. “We’re asking those companies that don’t have a policy and where we don’t see any women on the board to implement a policy and change that situation,” she said. Two of the other targeted companies did not reply to requests for comment on the proposals, while Constellation Software chief financial officer Jamal Baksh said the company will address the shareholder resolution when it publishes its management information circular. The campaign comes as large institutional shareholders are growing increasingly active in their demands for better representation of women in senior ranks. U.S. investment giant State Street Global Advisors announced on Tuesday it will begin pushing the roughly 3,500 companies it invests in to put more women on their boards, saying it will start by targeting those with no women. State Street manages $2.47-trillion (U.S.) in assets in passive funds that typically track the composition of major stock indexes, giving it enormous clout to influence board appointment decisions. The company said it will give companies a year to enact changes before it will begin voting against the re-election of chairs of nomination committees. To promote its campaign, State Street also installed a bronze statue of a girl in New York on Tuesday, facing the famous bronze bull statue that symbolizes Wall Street. Canada has seen some growth in the number of women in senior ranks in recent years. 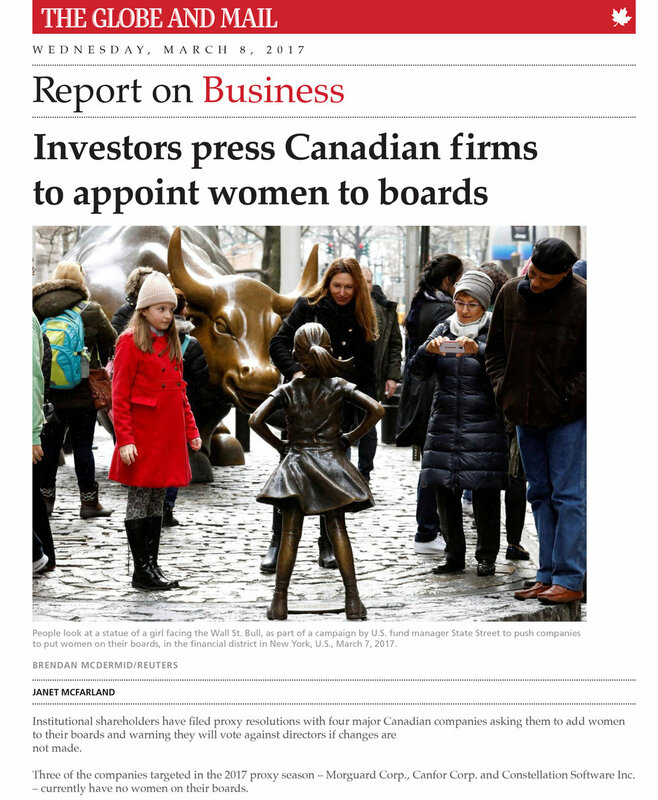 Women accounted for 20 per cent of directors on boards of S&P/TSX companies in 2016, an increase from 17 per cent in 2015 and 15 per cent a year earlier. The proportion of women in top executive ranks has climbed more slowly, however. A report released on Monday by executive search firm Rosenzweig & Co. shows women filled 9 per cent of top executive-officer jobs at Canada’s 100 largest companies in 2016, an increase from 8 per cent a year earlier. The review looked at reports companies are required to file each year disclosing compensation of at least their top five executives. The survey found 39 companies have at least one woman in a top leadership role, up from 34 a year earlier.